The Nokia Microsoft McLaren (aka Nokia Lumia 1030), the handset that is rumored to be the next big Windows Phone flagship with a PureView camera and top-shelf specs, has appeared multiple times on the rumor mill - and while latest whispers have suggested that Microsoft might have scrapped the project altogether, we keep on seeing leaks of the device prototype. This latest set of nearly 50 images shows the Microsoft McLaren alongside none other than the Apple iPhone 6, and this comparison alone tells us that the prototype is fairly recent. You can also clearly see the label on the device saying it is a 'prototype property of Microsoft Mobile', something that indicates that it is not an old Nokia development. The most interesting element, however, is without a doubt the large, protruding camera. While we have no way to measure, it seems that the camera hump has grown even larger on the Microsoft McLaren than it is on the Nokia Lumia 1020. Having such a large, but also very noticeable camera is a double-edged sword - image enthusiasts will love it, but those who don't care all that much about the camera will likely find it hard to deal with its bulk on a daily basis. In either case, it seems that Microsoft is clearly working on the next big thing for Windows Phone, and while this early prototype is no guarantee that it'd look like this, we at least know one of the directions that the company is going to. Who cares for a 3 years old phone that never made any significant sales and is considered outdated in every single aspect beside the final image quality? Just cause a Ferrari from, 1998 has a 0-100km in 3.4sec it doesn't mean you will compare that Ferrari with a brand new BMW M3. You NOKIA sheeps are worse than any of the android ones. Move on. I like how you add unnecessary analogies to make yourself sound smart. You are pretty sad with your stupid reply, get a life! Just another poor Android troll. Move on. I am not an Iphone fan, but the Iphone looks so much better! Agreed. The display seems to have a weird bluish tint to it (see pic 16 & 18). Also on the back that glossy camera lens is gonna attract a lot of scratches while placing it on the surface. Every galaxy S flagship had a protruding camera but no one ever cared until the usually flat iphone had one. Who cared if the users of the iphone don't? Its like making a fun of a Ferrari just cause it has a bigger than normal spoiler. Because they didn't wobble as much. In addition to what XperiaFanZone said, Another reason is most of us use covers for our $800 anorexic phones. So by putting covers the phone won't wobble while putting it down. However, in Lumia's case a cover won't help either as the protrusion is much higher and very wide as well. No cover can cover that protrusion unless its very-very thick ! Not if the glass is gorilla glass. Also doesn't the iPhone have a perturbing camera? Actually, since the camera is in the middle it won't be lopsided when you place it on the table. Unlike the ugly iPhone. For example Sony can make 20 MP camera phones without making a thick device, with a protruding camera. Is it true today? Let's do this in a much more proven way than just pushing a rumor. Ready... Rock, Paper, Scissors... SHOOT!! Paper covers rock. McLaren is real today. Check with me in a couple more days, as rock could break something and this will be proven false. Both look good . Oh i've got a question . Should we use the word "leak" for 50 images?!?! Doesnt matter if its 1 or 50. If its not officially(which obviously is not as MS just confirmed they arent working on this phone, lol funny) allowed by Microsoft then its a leak. 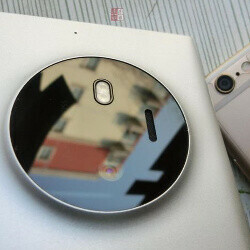 Ugly phone camera hump on the back, much better if they did the same way like the camera hump on the 808 Pureview. http://www.komputerswiat.pl/media/2012/206/2481904/rys4-full-nokia-808-pureview.gif This is no better than the 'camera' hump, not to mention the 1020 is 3cm thinner and would imagine this phone to be about the same dimensions. Thing is its a camera phone, like a samsung galaxy K, so first comes the camera part then the phone aesthetics. And to be honest this thing looks much better than any other camera phone nokia or samsung did. I like the hump... on the 1020. But on that phone it's metal and obviously there to protect and accent the awesome camera. Not so sure the glass hump on this phone is doing much protecting. Really bad mistake by Microsoft, Nokia did it right Xenon flash are still way better than led flash.